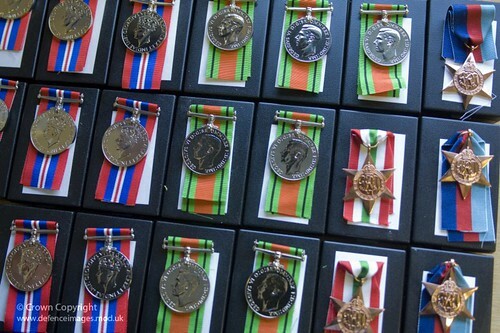 More than 100 British veterans are considering handing back their medals to the Government to protest against their frozen pensions. The veterans, who have more than 600 years of military service between them, have delivered a petition to Pensions Minister Steve Webb complaining that their state pension is not increased in line with inflation each year because they live outside the UK. Britons who retire to a number of countries outside the UK, including Canada, Australia and South Africa, have their state pension frozen at the level at which it was when they left the country or retired, although those who retire to countries with which the UK has a reciprocal tax agreement, such as the US and EU countries, continue to receive an annual inflationary increase. The veterans are calling on the Government to change the situation. They said they felt so outraged by the way they have been treated by the Government that they are prepared to hand back their medals in protest. The International Consortium of British Pensioners estimates that around 500,000 people are affected by the freeze, with these pensioners receiving less than 60% of the income they would get if their state pension had been increased in line with inflation. It warned that with rising living costs, the situation was putting many pensioners who live overseas in an "extremely difficult financial state". John Markham, spokesman for the International Consortium of British Pensioners, said: "David Cameron has pledged to make pensions fair for all. Only when all British pensioners, no matter where they live, including these brave veterans, have their pensions raised equally each year, will we believe he means it. "After 50 years of injustice, it has come to the stage where men and women who fought for this country feel so abandoned that they would renounce their hard-won war medals." Leading Wren Peg Buchanan, who served at Bletchley Park helping to break German Enigma codes, said: "The British Government has shabbily treated not only veterans but all UK people who have either moved by choice or expedience away from their former homeland and do not get the full benefit of a pension that they paid into. "If the Buchanan family had lived two miles further south from where they settled in British Columbia, they would have been in Washington USA and their British pensions would not be frozen. It's shameful."